I know, pumpkin pie is a North American classic, and has been for years. You all have probably been making them, or sampling them, forever. Most of you undoubtedly celebrate Thanksgiving with a slice of pumpkin pie(or two...or three) and I must admit that I've felt somewhat out of loop knowing I had never had a piece. As you probably know, pumpkin isn't a commonly used ingredient in France.. and Thanksgiving not exactly a celebrated holiday - hence my lack of pumpkin-pie eating growing up. All to say, that I was in dire need of making my very first pumpkin based dessert! I followed Anna Olson's recipe from foodtv.ca October 'cooking club challenge', and found myself happily surprised when I was sent a copy of Food 2.0:Secrets From The Chef Who Fed Google as a winning prize. And what could be better to complement a lovely orange-tinted pie than the scenic view of falling fall leaves? For the dough, follow my fail-safe pate brisee recipe. On a lightly floured surface, roll out the dough to just under 1/4 inch thick. Dust the bottom of a 9-inch pie shell with flour and line with the dough. Trim edges, keeping scraps to roll and cut for garnish, if desired. Blind bake (using beans to make sure the dough does not rise) for 7-8 minutes. In the meantime, make the filling :whisk the pumpkin with the brown sugar, molasses spices and salt. Whisk in the eggs and the whipping cream. Pour into the pre-baked pie shell. Bake for 10 minutes, then lower temperature to 350 degrees F. and bake for 20 to 30 minutes, or until the filling puffs just a little around the edges but still has a bit of jiggle in the center when moved. Allow to cool to room temperature, then chill completely. 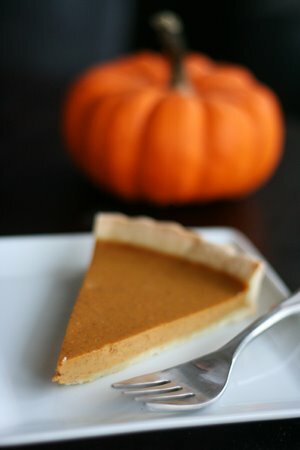 To serve the pumpkin pie warm, it is recommended to bake and chill completely, then re-warm in a 300 degrees F. oven for 15 minutes before slicing. Enjoy! Good for you for going for it! I have never made a pumpkin pie since it is the job of one of my mom's friends each Thanksgiving. I actually don't even like it which is a sacrilege in my family where everyone loves it. Anna Olsen's Sugar show is still one for good reason...her desserts are amazing! Thank you for visiting my food blog and leaving such a kind comment. How wonderful to visit a blog that I could only ever aspire to! Pumpkin pie isn't something that I have either made or indeed eaten. Perhaps, someday? Goodness, your pie looks so neat! It's so funny that I've been living in the U.S for such along time, but never really tempted to make Pumpkin pie, even on Thanksgiving day! Maybe I should try to force myself to do it this year. That pumpkin pie looks brilliant! We don't see them much in the UK, I really should make one. You did a wonderful job with your pumpkin pie! I grew up in a family of pumpkin pie haters so I had to wait until I was an adult to fall in love with it myself. I've wanted to read the Google chef book so let us know how it is after you read it! The photography on here is superb...and that pie looks incredible! Great pumpkin pie! I made pumpkin pie (tarts) recently too! This looks like a fine version of a classic! Yum! The pictures really set the mood! The pie looks wonderful. LOVE the photo of the dog! I have no idea why I only eat pumpkin pie on Thanksgiving. There's no good reason, and so this, THIS will be the year I cast off the ridiculous once-a-year-pumpkin-pie tradition and branch out. Many thanks for the inspiration. My heart's beating a little faster! A true classic!! Looks great!! I hope you enjoyed your first pumpkin pie! Gorgeous photos! Pumpkin pie is just about my favorite dessert. I even request it for my birthday [in October] instead of cake. This sounds like a delicious version, and I love your autumnal photos! This pie looks great - I saw it on tastespotting! Oh my. You've made me simultaneously hungry and homesick with the beautiful photos of the pumpkin pie and the fall scenes. No such vignettes here in sunny So Cal. 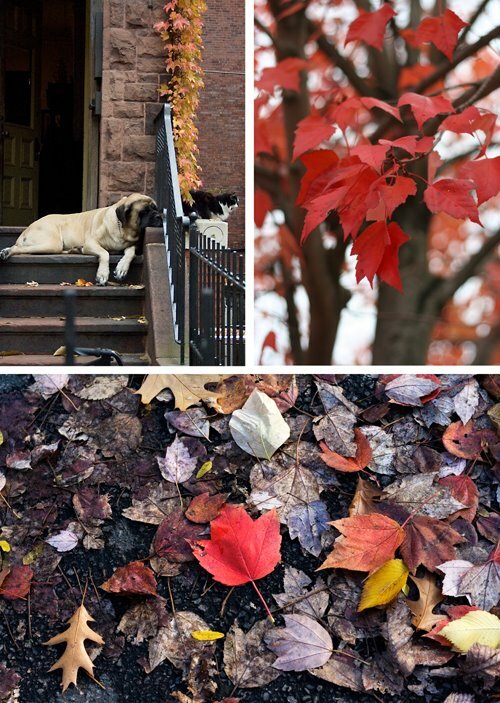 Love this post full of Fall colors, something we sorely miss here down south!! The pumpkin pie is perfect! Amazing photos.. Also liking your pate brisee recipe :) Thanks! Wonderful looking pie. Your photos are beautiful. What colors! The molasses in the pumpkin sounds fantastic! It's a favorite flavor of mine but I've never seen it in pumpkin pie. The fall images are beautiful as well. Are the dog and cat yours? Beautiful pictures and what a cute dog! Delicious looking and delicious tasting and quite simple to make! I've never made spiced pumpkin pie before. These were pure delight and I'm sure to make them again. Jeremy: I'm glad you liked it!